In North India Sawan month begins on July 23, Tuesday. The first Sawan Somwar Upavas would be observed on July 29, Monday. In many Indian states Shravan month begins 15 days later than that of North India. Please visit Sawan Somwars for the complete list of fasting days during Sawan month for both North and South Indian states. Sawan, which is common name for Shravan month, is holy month to please and seek blessing of Lord Shiva. Although whole Sawan month is good to observe fasting for Lord Shiva but all Mondays during Sawan month are considered very significant to observe it. Apart from Sawan Somwars, Sawan Mangalwars (Tuesdays) are also significant to seek conjugal blessings from Goddess Parvati, the consort of Lord Shiva. 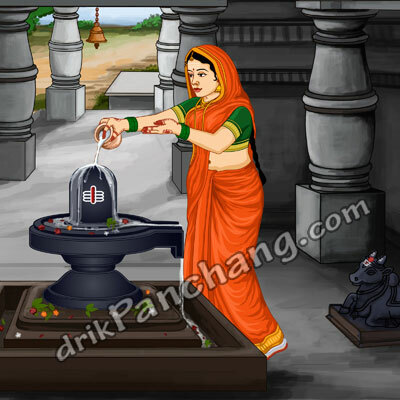 Married women, especially newly wedded, observe Mangal Gauri fasting on each Tuesday of Sawan month. The complete list of Mangal Gauri fasting days in 2013 is available at Mangala Gauri Vrat Dates. Apart from two Pradosh fasting days during Sawan month, Sawan Shivaratri and Sawan Amavasya are also significant days in North India. Sawan Amavasya is more popularly known as Hariyali Amavasya. During Hariyali Amavasya special Darshan are arranged in most Shiva temples.